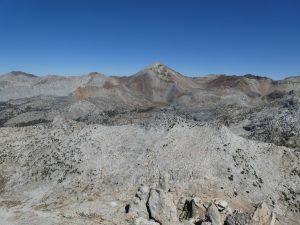 Izaac Walton is an SPS peak along the Silver Divide, buried near the center of the Sierra between Mammoth Lakes and Lake Thomas Edison. Because it has difficult access from the east and relatively few high peaks, I have spent relatively little time in this part of the range. The best eastern approach to Isaac Walton is via the long but scenic trail over McGee Pass, which I had used once before to reach Red and White Mountain. The pass is slightly higher than the peak, and one must drop 1500 feet on its other side. I got a reasonably early start up the semi-popular trail, climbing gradually east, then south past colorful Mount Baldwin, eventually emerging from the forest into meadows below Big McGee Lake. 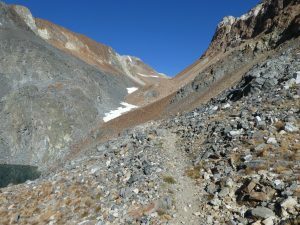 Here the valley and trail turn back east and north, climbing through the region’s colorful garbage-rock to McGee Pass, a saddle near 12,000′ between Red Slate and Red and White Mountains. Not having seen any tents, I was somewhat surprised to pass a lone backpacker just below the pass, possibly headed for one or both of the nearby peaks. The other side of the pass seems to see much less traffic, and its maddeningly flat switchbacks are gradually fading. I followed the trail for a bit, then cut directly cross-country to eliminate long stretches of pointless meandering. I left the trail near an unnamed creek, passing directly south through a gap to cross Fish Creek and emerge near the inlet to Tully Lake. I continued more or less south, aiming for the unnamed cross-country pass leading to Bighorn Lake. I was surprised to meet a lone backpacker here, moving fairly quickly despite his overnight gear. I angled slightly toward him, but he seemed to want to pretend that I did not exist, so I passed without acknowledgement. 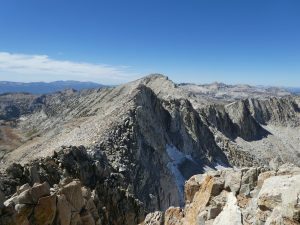 I made my way up a mixture of talus and slabs to the saddle, then traversed through ledges and scrub around the south side of Point 11,588′ to the base of Izaak Walton’s northeast ridge. This was rumored to be a fine class 3 scramble, but began as a disappointing pile of sand and talus. It fortunately improved higher up, with the last few hundred feet along the crest being sustained and fun. I glanced through a list of the usual suspects in the summit register, then took in the views from the middle of an unfamiliar part of the range. Lake Edison was clearly visible to the southwest, and the back sides of Red and White and Red Slate to the northeast. Directly west, I could see where an unfamiliar stretch of the JMT crosses Silver Pass on the other side of Evon Benchmark. Though Evon and Peak 12,238′, the two ends of the Silver Divide, are both higher than Izaak Walton, for some reason neither has a name or a place on the SPS list. 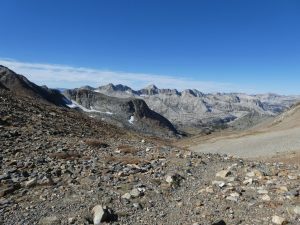 After finishing my snack, I retraced my steps, finding a slightly higher and better traverse to the Bighorn Lake col. Right where I rejoined the trail, I was surprised to see a good-sized toad. 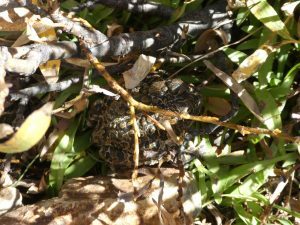 Fortunately he was alone, and both less disgusting and more wary than the giant toads of the Big Beaver, scurrying into the bushes before I could get a clear photo. The climb back up McGee Pass was sort of a slog, and I did not feel like running as much of the gradual descent to the trailhead as I probably should have, but I had plenty of day left to reach the car. I passed a pack train and a number of humans near a mud flat below Steelhead Lake. They were maybe 100 yards off the trail, and it looked like they might be posing for a pack company advertisement, with the golden aspens and red and white rock in the background. It certainly didn’t seem like a normal place or time to set up camp.